Walt Disney Parks and Resorts own and operate the Disney cruise ships, which mean you will be experiencing the same quality magical experience as at Disney World... only this time the fairytale happens at sea. Disney cruise is the ultimate family adventure and truly a magical experience for the whole family. It is difficult to imagine a child that will not love the Disney cruise experience. It also gives the adults unique opportunity to get in touch with the child within. Disney cruise ships are designed with the vacation needs of the whole family in mind. There are great common areas where the whole family can enjoy spending time together, as well as separate areas appealing to specific age groups, including special areas for teenagers... and adults. 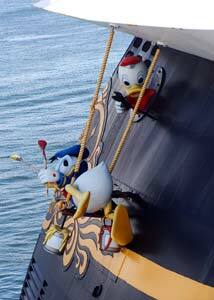 It is not only the Disney cruise ships facilities, which are great for the whole family. The activities onboard are world class and designed with the whole family in mind. The kids are of course the VIP passengers but there is wide range of activities for all age groups on offer, even for the adults. Disney cruise is one of a kind vacation experience... a fairytale come true. It is an experience, which most parents would love to share at least once with their children. There are currently three Disney cruise ships in operation, but the fourth one, Disney Fantasy will join the Disney fleet early in 2012. Disney Magic and Disney Wonder are sister ships and offer the same basic themes, with some individual touches along the way. Disney Dream joined the fleet in 2011, it is bigger and offers some new features, including the exciting AquaDuck, the very first water coaster at sea. The onboard facilities are simply amazing but they are designed especially with the needs of the whole family in mind. The cabins are comfortable and quite spacious staterooms. The bath and a half is very convenient feature for families, i.e. shower and toilet are separate. Disney cruise ships feature number of distinctly themed restaurants and their innovative rotating dining system means you change restaurants every night, while keeping the same servers and tablemates throughout. Their diverse menus appeal to their young VIP customers but adult exclusive restaurants and bars are also available. Disney Magic and Disney Wonder have each three stunning swimming pools, serving different needs of the family. The Goofy's Pool is for whole families to play together, while Mickey's Pool is just for the kids and the Quiet Cove Pool is a getaway exclusively for those 18 and over. Disney Dream has the same set of pools, but in addition Nemo's Reef, a whimsical water play area, and of course, the famous AquaDuck water coaster. The onboard facilities also include day spa, beauty salon and fitness center for those over 18 years of age, as well as recreational sports courts for the whole family to enjoy. There are number of nightclubs and lounges onboard all the ships. Some are for adults only, while others are themed areas where adults and kids can dance, enjoy live music, and participate in games and activities. However, the onboard entertainment and kids clubs is what makes Disney cruise ships such a fairytale family vacation. The entertainment onboard Disney cruise ships are what make Disney cruise such as magical vacation experience for the whole family. Passengers will meet and greet Disney characters on their cruise, as Character Greetings take place throughout the ship, both in designated places and during special surprise appearances. It is not always just the kids, which enjoy shaking hands with Mickey Mouse and Cinderella! The onboard theatre offers number of Broadway caliber Disney musical live shows, featuring some of the most popular Disney characters. The cinema shows the latest movies throughout the day, including digital 3-D films and Disney favorites. Disney cruise ships operate number of Disney themed kids clubs, lounges and interactive programs... all designed to keep your child having fun throughout your cruise. Oceaneer Club is the ideal place for children 3 to 10 years of age to dress up as their favourite princess or hero, play games, use the computer lab and enjoy a wide variety of supervised activities throughout the day. Vibe is teens-exclusive hangout, where teens aged 14 to 17 can make new friends, play videogames, watch television, and enjoy a variety of fun-filled activities throughout the day. Studio Sea is the ideal place for families to sing, dance, play games and enjoy live entertainment together... just to mention few of the onboard activities. 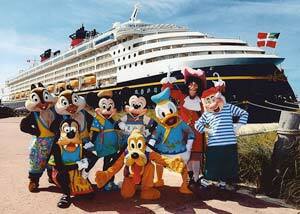 Disney cruise vacation is an all inclusive family vacations, i.e. the fare includes accommodation, dining, entertainment, character experiences and wide range of selected onboard activities. There are however some exceptions to every all inclusive family vacations. Some activities are normally not included in the price of the cruise, e.g. spa treatments and use of daycare center. The same applies about some land excursions, souvenirs, some drinks onboard, etc. Do not forget to budget for those extras, they can add up quickly, so it is important to include them in your total holiday budget. There is a good range of destinations to choose from for your Disney cruise vacation. You can discover the best in Europe, cruise the Mexican Riviera or explore the wonders of Alaska. You can even go on transatlantic cruise with ports of call on both sides of the Atlantic Ocean. However, the Caribbean and Bahamas are still the most popular destinations for Disney cruise vacation. The Bahamas cruises are 3 - 5 nights (8 nights if departed from New York), while the Caribbean are 6 - 8 nights. Both cruises include a day at Castaway Cay, the private Disney Caribbean beach resort in the Bahamas. There passengers can enjoy tropical leisure activities like snorkeling, boating, swimming in the sea as well as old-fashioned sunbathing on the beach. Disney cruise vacation is hardly the cheapest family vacation available, so the big question is can you find cheap Disney cruises or at least discount Disney cruise. The Disney Cruise Line offers special offers on on-going bases. They are definitely worth checking out though they tend to be somewhat specific, e.g. discount on Caribbean cruises for Florida residents or on Mediterranean cruises for European residents. U.S. Military staff can also get cheap Disney cruises on selected sail dates. Your best bet to find discount Disney cruise is to check with the big travel sites, who have on-going section for discount Disney cruise deals. Due to their size, they have stronger negotiating power with the cruise lines than smaller travel sites. The same applies for travel sites that specialize in cruises. They tend to get better prices from the cruise liners than travel sites that do not specialize in cruise vacations. However... cruise prices tend not to vary much from one seller to the next. More often than not, the difference between cruise deals lies in the included add-ons, rather than the actual price itself. These add-ons can be from complimentary Champagne, free spa treatments or land excursions. Onboard credit is also common add-on, i.e. you can put your credit towards a variety of onboard activities. So if you are not seeing differences in cruise fares, look for the add-ons to save money. You can spend endless hours searching the internet for cheap Disney cruises and you should definitely shop around and compare different prices. However, when you have found something you like do not wait too long to book it, or you could lose it. Cruises are popular form of vacation and the best deals go quickly. Nb. the best deal is not only about the best price, it is also the best dates, the best cabins, the best cruise ship, etc. The first step is to understand the price range for what you are looking for. Then set a realistic budget, search for it, book it and then stop thinking about the price of your cruise vacation. Ps. if you like Disney cruise you might also like Disneyland. Check our Disney World Travel Tips and find out how you can save money among other travel tips when visiting Disneyland.